As low as $3.29 per coin over spot! The New Zealand Mint produces one of the most robust lineups of Star Wars-themed precious metals youll find when you buy silver online. The coins from New Zealand Mint range from classic characters from the original trilogy to the newest characters introduced in the sequel trilogy that launched in 2015. The 2019 1 oz Niue Silver Star Wars Clone Trooper Coin is the latest addition and is available to you for purchase online from JM Bullion. Coins arrive in individual plastic, mint tubes of 25 coins, or themed monster boxes of 250 coins! 4th release of Star Wars bullion silver coins! Issued a face value of 2 Dollars (NZD) by Niue. On the obverse is Queen Elizabeth IIs effigy. The reverse features the image of a Clone Trooper running into battle with his rifle. Officially licensed images and copyright seal of Lucasfilm Ltd. The feature-film phenomenon that is Star Wars began with a trilogy of films released in the late 1970s and the early 1980s. This was followed in the late 1990s and early 2000s by a new prequel trilogy of films setting the stage for the events before the original films took place. Most recently, in 2015, a new set of Star Wars films came to the box office. In the official trilogy of films in this release, fans of the series are offered a glimpse into the future of the Empire and the Rebels following the events of the original trilogy of films. Additionally, there are standalone films that attempt to fill in the narrative between the various sets of trilogies released over the past five decades. On the obverse of 2019 Silver Star Wars Clone Trooper Coins is the image of Queen Elizabeth II. This right-profile portrait of Her Majesty comes from Ian Rank-Broadley who created the image for the Royal Mint of England in 1998. It is the fourth-generation design for British coinage and most Commonwealth nations, and is slowly being replaced as of 2016 by a more recent portrait of the Queen. 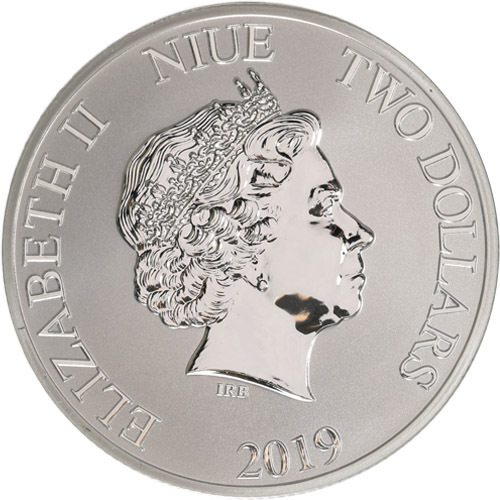 The reverse of 2019 1 oz Niue Silver Star Wars Clone Trooper Coins features the image of one of the most iconic, albeit faceless and nameless, characters from Star Wars. The Clone Trooper here is armed and ready for battle as he storms the field. Clone Troopers first appeared in Star Wars: Attack of the Clones, the second film in the prequel trilogy that was released in 2002. We encourage JM Bullion customers to contact us with questions at 800-276-6508. You can also connect with us online through our live chat and email address features.